This quick review was provided by a reader, whose daughter is allergic to wheat, dairy, all nuts and shellfish. We have eaten here a few times and they do a great job! My daughter is allergic to wheat, dairy, all nuts and shellfish. They prepared a safe meal for her, and even had warm rolls for her to start! We will certainly be there again on our next trip to Disney World! 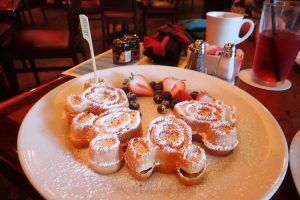 If you would like to review Hollywood Brown Derby or any Disney restaurant, submit a food allergy dining Quick Review. This quick review was provided by Brenda, who avoids gluten. It was my first time eating GF at Disney. Chef Boone came out and spoke to me personally, letting me know what was safe and what wasn’t. I got my own GF rolls, and a plate of rice, vegetables, and delicious chicken wings. The salad and all the meats were safe. I also got my own dessert of chocolate chip cake and ice cream with fresh berries. Chef Boone and the staff were great, and my meal was excellent! 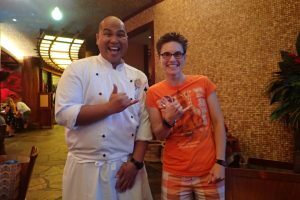 I highly recommend ‘Ohana for GF dinner! 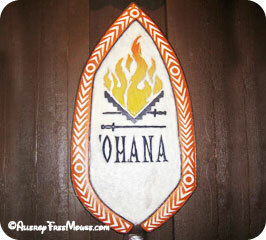 If you would like to review ‘Ohana or any Disney restaurant, submit a food allergy dining Quick Review. This quick review was provided by Sherill, whose daughter is allergic to all nuts. We have eaten here several times, and the nut allergic family member loved that all of it was safe. She particularly enjoys being able to eat dessert. We came here on Christmas Eve 2017 and were given a food allergy guide grid which confirmed that everything was safe. We went straight to the desert part of the buffet and loaded up a plate with desserts. When we got to the table, the chef had come to discuss the food allergies. He told us that two of the desserts were not, in fact, safe. They had added two desserts that week that were not safe for nut allergy. If he had not shown up at that time, I think my daughter would have eaten a bit of the almond flour desserts already. He brought her desserts from the kitchen that had not mingled with the buffet desserts. It was a close call. If you would like to review Biergarten or any Disney restaurant, submit a food allergy dining Quick Review. This is a more formal table service restaurant, with a dress code. We ate here several times throughout our trip and experienced excellent allergy service from the chefs. 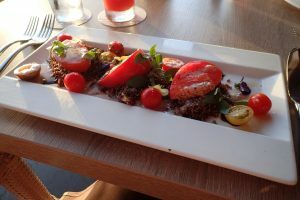 My allergies were noted on every reservation, they put a bright red ‘ALLERGY’ stamp on our reservation ticket when we arrived, and the chefs took my orders on their little yellow special diets notepads and pink allergy tickets. 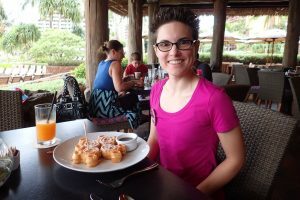 This quick review was provided by Jennifer, who is allergic to tree nuts, peanuts, potato, wheat, and sorghum, is dairy intolerant and has a vegan preference. Breakfast: They have a dedicated Mickey waffle maker here, just like at Makahiki, with the same waffle mix. Since that’s my favourite breakfast at Disney, why try anything else? (Nothing else looked safe or interesting, anyway.) After the chef brought out photos of the waffle mix ingredients for me to check, and confirmed everything, I had a large plate of waffles, warmed maple syrup, and a side plate of fruit for breakfast. Yum! The chef at Makahiki had a better presentation for breakfast, but that is likely due to that particular chef being more creative than the one I had at ‘AMA’AMA that morning. Lunch: We had two lunches here. They have both an allergy menu and a vegetarian menu you can have on request. Upon speaking with the chef, we were able to make options on the vegetarian menu safe for my allergies. Both days I opted for a salad and a pan-fried tofu dish, though different variations each day. They don’t have beans in either kitchen… so tofu it was. No safe desserts except fruit, which we skipped in favour if shave ice later in the afternoon. Dinner: We actually canceled another lunch reservation to eat a second dinner here. This is a beautiful location to watch the sunset over the beach whilst you dine. The dress code and atmosphere are a little more refined at dinner time, which we appreciated. After all, we never eat out at home (due to allergies) and don’t get to dress up often outside of vacation. They have both a vegetarian and allergy menu at dinner as well. The chefs again were able to make something from the vegetarian menu safe for me. One night it was a stir-fried vegetable dish and the other was a quinoa salad. 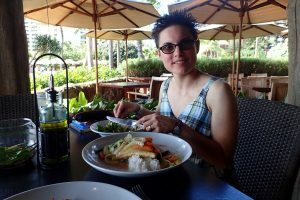 I loved their salads and papaya seed vinaigrette – which was good on salad, vegetables, and tofu. The only safe dessert option was fruit, and we usually skipped it for a treat in our room instead. This is the buffet-style restaurant, often used for character meals. We dined here for one character breakfast and one character dinner. We enjoyed the story and theming of dinner, even without kids. Uncle told the story of the Menehune, mythical creatures that build things at night and also create mischief. The breakfast seemed really random and loud for us, but Aunty was engaging the younger kids often, so it may have been more fun for kids than adults alone. Each meal had one character greeting at the entrance and three or four characters wandering around to meet guests. Our two most memorable meals were at this restaurant, actually. Whether that was because the kitchen had more resources or we just lucked out with exceptional chefs, I don’t know; likely a little of both. Per usual, we spoke with the chefs on arrival. Never was I told to look at the buffet, though one chef mentioned they didn’t use any peanuts or tree nuts at the breakfast buffet. (I didn’t ask about traces since it didn’t apply to me. And I would never recommend anyone with food allergies eat from a buffet, regardless.) 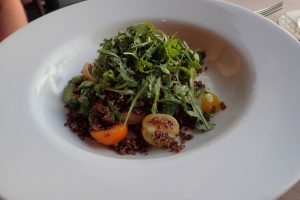 My allergies were noted on every reservation, they put a bright red ‘ALLERGY’ stamp on our reservation ticket when we arrived, and the chefs took my orders on their little yellow special diets notepads and pink allergy tickets. My meals usually came out with allergy toothpicks in it. Character Breakfast: The chef asked me what I wanted to eat for breakfast, and what I normally eat at home. Originally, I said I eat oatmeal for breakfast at home, and the chef said he could make me some… but then I mentioned how most traditional oatmeal isn’t safe due to traces of wheat. I was initially uncomfortable with this chef as a result of that confusion, which I partially caused, but the situation quickly turned around when I mentioned Mickey waffles and fruit and he came back with photos of all the ingredients and told me how they are made in a dedicated waffle maker, in a dedicated area of the kitchen to prevent cross-contact. Even the fruit for my meal was prepared separately and fresh to ensure it was safe. The waffles came with powdered sugar, small sealed jars of pure maple syrup, and a heaping plate of tropical fruits. The chef cleared all ingredients with me before placing the order. The waffles were the best I’ve ever had and the fruit was fresh and flavourful. 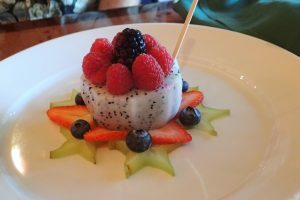 At the end of breakfast, when I could barely eat another bite, the chef came out with a beautiful anniversary ‘cake’ made from fruit. He said that because I couldn’t have the normal anniversary cake that he wanted to do something special, and fruit was the only guaranteed safe option. The ‘cake’ was like a piece of art… I didn’t want to eat it… but I did. Well, part of it; I was too full to eat it all. My husband got the regular anniversary chocolate mousse/lava cake. Character Dinner: Again, the chef came out to ask what I wanted to eat. I had spoken with this chef before and he already knew my preferences, but he wanted to make something different. 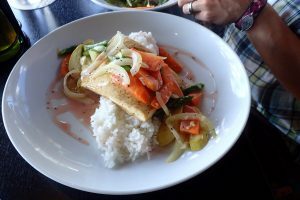 He asked if coconut was safe for me, which it is (in most cases), and made a light and flavourful tofu and vegetable dish with a coconut-lime-ginger dressing. I should have asked for the coconut sauce recipe – it was that good. I also had salad and a tropical fruit bowl for dessert. Again, the chef mentioned how my meal would be made by him in fresh pans with fresh utensils to make sure it was safe and free from cross contact. That reassurance and attention to detail is much appreciated. This quick review was provided by Jack, whose daughter is allergic to cashews. My wife, daughter and I had signed up for the afternoon Wanyama Safari. I specifically registered with Disney and at every restaurant, my daughter’s cashew allergy. Every place was awesome with one absolute MAJOR exception. This was Jiko. Before our trip I called and registered the fact that my daughter had a cashew allergy. I called the morning of our Safari and reminded them of my daughter’s allergy. I was assured that there would be no problem. Because of our other positive experiences with Disney being very good about allergies, I was lulled into a sense of security. As it happened, there was only one other couple that had signed up for the safari. I again, reminded the young lady who greeted us about my daughter’s cashew allergy. Before the safari they set up a buffet of various finger foods. As is protocol for our family, I went in to the room where the food was presented to check it out. Sure enough there was a bowl of cashews set out. I was shocked by this. I am not exaggerating the redundancy of my checking in with Disney staff about my daughter’s allergy. We had a very near disaster on our hands. We brought this up to the staff and they did nothing. They did not even remove the cashews. not have to worry when I did have to worry. 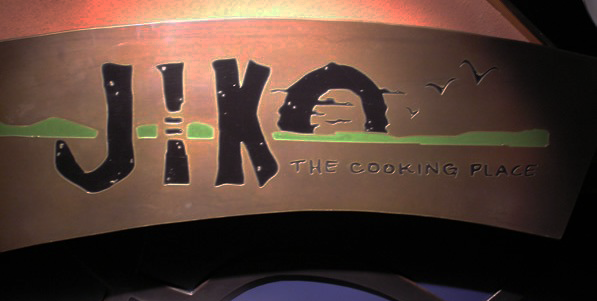 If you would like to review Jiko or any Disney restaurant, submit a food allergy dining Quick Review.